The 2019 Australian Youth Ultimate Championships will be held in Beenleigh, Queensland from the 12th – 14th July. For anyone interested in playing in either of the Victorian teams to compete at Youth Nationals this year, please complete the Expression of Interest form below. There will be greater opportunities to be involved with the U18 Victorian State team program this year with the addition of a Mixed division at the Australian Youth Ultimate Championships. In the EOI form, players are required to select the team you wish to try out for, and are also welcome to select your 2nd preference if interested to be considered for multiple divisions provided your 1st preference was not successful. The selection days will feature both split gender and mixed formats, with all teams to be selected at the same time. Each selection day will feature half day mixed and half day men’s/women’s. The U18 Victorian coaches are currently running FREE come and try sessions each Saturday afternoon leading up to the selection events on 4th and 5th May. These sessions will provide a great opportunity for anyone aged 14-18 to come along and give Ultimate Frisbee a go and to learn more about the sport. Fundamentals about how the game works as well as throwing techniques will be taught. The coaches are extremely welcoming and supportive and will help allay any fear of trying out for the Victorian teams if you are new to the sport. Players interested in playing for the U18 Victorian teams are encouraged to attend these sessions before the selection events. Is your school team participating in the High School State Championships? Come on down for some extra training and tips from our Victorian coaches. You may even decide to play for Victoria! Can’t attend any of the come and try sessions or selection events? 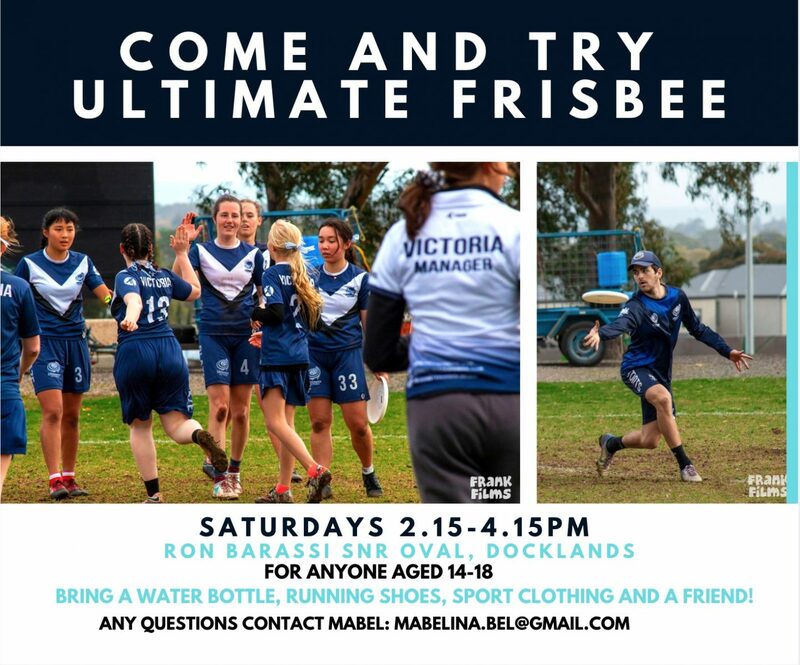 Please send a written summary of your previous experience, motivations for wanting to join the Victorian team, and a reference from someone established in the Victorian Ultimate community (if possible) to jack@ultimatevictoria.com.au by Friday 26th April.